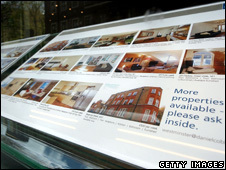 Scotland is the only part of the UK where house prices are continuing to rise, figures suggest. The Royal Institution of Chartered Surveyors (RICS) said 90% of its members reported that costs were either rising or staying the same. However, new buyer enquiries fell in Scotland last month, with 34% more chartered surveyors reporting a fall than a rise in enquiries. This fell for the third month in a row and at the fastest rate since 2007. The Institution said many potential purchasers were either struggling to raise the necessary deposit, or were being cautious in the light of current economic conditions. It also claimed potential sellers were holding back, with new instructions to sell property in Scotland dropping compared to a year ago. RICS Scotland director Graeme Hartley said: "Scotland is in a unique position with house prices continuing to increase, albeit not at a 'booming' rate. "The general feeling within the industry is that the Scottish market is currently holding up well, despite the downturn in new instructions reflecting the limited finance options currently available. "The figures reflect a housing market that's holding its breath, waiting to see what will happen in the financial market, but certainly not one heading for a crash. In fact it is quite the opposite in Scotland." He said the next few months would be an interesting period for homeowners but would-be buyers with larger deposits may see this market as an opportunity to take advantage of the slowing in house price rises. In contrast most surveyors in England and Wales reported a fall in prices.